It works exactly the same, but possibly better. The consistency of this product is like eggs, it’s a bit slimey and honestly that’s my only complaint. And it’s not a real complaint because I think the egginess helps me to spread it better than if it was creamy and would just plop and clump in hunks on my hair….ya know? I say it’s possibly better than Mixed Chicks because, despite the slime factor (which Mixed Chicks has too by the way) there’s a moisturizing feeling to the product as well. I don’t know how different the two formulas are though. 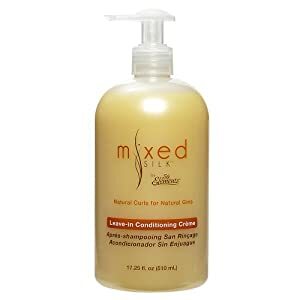 I use Mixed Silk after I moisturize my hair with a separate product. I apply it in sections to wet hair for wash n gos only. If I’m not wearing my hair out and curly, I do not use this. It gives hold without being mega crunchy, and I don’t end up all frizzed out by the end of the day. If you’ve ever wanted to try Mixed Chicks , I URGE you to try Mixed Silk first. I’ve only used ths deep conditioner once so far. It’s only $5.99 on amazon . I may post another review after I try it a few more times but so far I kinda dig it. My only complaint would be that it didn’t give me a lot of “slip.” It did however give me soft and strong feeling hair. It smells okay and it’s thick and creamy. I used this on towel dried, shampooed hair. I covered it and used heat for about 20 minutes, then went about my business for the rest of the day. I’d say it was on my hair for a total of 5 or 6 hours. When I rinsed, my hair felt very soft, but also hearty (if that makes sense) if it also had slip I may have passed out in joy. It wasn’t a big pain to detangle though. I bought a huge tub of this so now that I chopped, even though I plan on DCing ever week, this will last longer than usual. Yay! Have you used either of these products? Anything else in the Elasta QP line you’d recommend? Have you tried both MS and MC? How’d you compare them? « I love you all so much! I haven't tried these but I want to. Thanks for the review. These products look great, I will look for these to try. This is my first time to your blog, I'm glad I came by. I have use the mixed silk leave in, I love the moisturizing feel, the light hold and the curl definition, but once it dries up I get mad flakes… so much I'd had to do an emergency co-wash! maybe I'm using too much. i haven't tried any of the above but i really want to! i have so many products i want to try but i get nervous, haha. thanks for the review! Okay I'm such a nerd. I bought these products today on my lunch break and just tried them. I also bought the soy oyl shampo which I loved. The deep conditioner was awesome. Yeah there is no slip. I didn't go under the dryer, I got ghetto with it and tied a plastic bag around my head for 30 min, lol. Once I rinsed it out I applied the mixed silk. It's been about 30 min still a little wet but it's looking SO GOOD, even the hubby says it looks awesome. My hair is not frizzy and my curls are defined. It gives me big hair but not too big. I get lots of shrinkage but I don't mind, I like the shorter look. Thanks for recommending these. Keya! I'm so glad you like it. If it's almost dry you can yank the curls down and they'll hang a bit longer. Lesapea – thanks for stopping in, hope to see you again! I bought the mixed silk today and LOVE IT!! It gave my NG (bec I haven't BC'd yet) definition!!! HoneyBun – that's awesome I'm so glad you like it…so…when's the BC?! I'm gonna have to go to Sallys and try this. I dunno if it's the weather or my new length this summer, but everything has been drying out my hair lately. I've deep conditioned and it's still sooo dry. I'm crossing my fingers this helps! Thanks for the review. I am new to your site, and I just ordered these products from sally’s beauty supply online… I got an extra 10% off too 🙂 I’ll give you an up date soon. Great site by the way!